In an effort to save money and reduce their impact on the environment, many homeowners, such as yourself, may be interested in installing solar panels on your home. Solar panels are a great option when it comes to reducing your utility bills. With enough solar panels installed on your roof, you can significantly reduce your reliance on the electrical grid. However, it’s important to note how solar panels can affect your roof, so make sure you start off with a roof that is capable of handling a solar panel installation. When it comes to your roof, you want to ensure that it is taken care of at all times. You don’t want a poor roof installation to lead to water leaks, so you certainly don’t want the installation of solar panels to result in water leaks. Unfortunately, water leaks are possible if your solar panels aren’t installed properly or your roof is in bad shape. Since your solar panels will require numerous holes, it’s important that you take the time to have your roof prepared before your panels are installed. To prevent roof leaks, make sure that you are installing your panels on a roof that isn’t dated and prone to damage, which will help prevent water leaks. If your solar panels aren’t securely attached to your roof, they can be susceptible to strong winds and other types of severe weather. In the right conditions, strong winds can cause your solar panels to break free and become a flying object, which is extremely dangerous. Beyond being a danger to you, a solar panel ripped off your roof can damage your roof. To ensure you don’t have to worry about any of these problems, start with a sturdy roof and ensure that the solar panel install is secure. Our team at Intelligent Design can conduct a roof evaluation to ensure that your roof is ready for solar panel installation. Much like other DIY projects, many homeowners believe that after watching a few videos they can install solar panels. Do not attempt to install solar panels if you don’t have experience working on roofs or installing solar panels. Although it may look like a simple project, a misstep can lead to costly roof repairs. 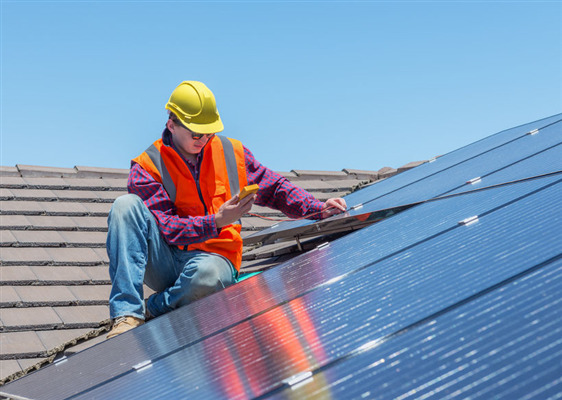 You should begin your solar panel installation by having your roof examined by a professional like our team, and then you should hire a solar panel contractor. Solar panels are a great way to reduce your reliance on the electrical grid. However, before you install solar panels, you have to know that your roof is fit for the installation. Our team at Intelligent Design is happy to examine your roof for you. If we find that your roof needs some repairs, we can take care of that too. Give us a call today to schedule a consultation. « Can You Remodel During a Restoration? What Are Your Options for Commercial Roofs?